We previously discussed cases of tourists demanding art in efforts to get memorable photographs, including a recent incident involving an American tourist. We now have an even more egregious incident where a tourist actually climbed on the leg of an early 19th Century statue entitled “The Drunken Satyr” to take a selfie and caused the entire leg to snap off. The incident occurred at the famed Academy of Fine Arts of Brera in Milan. A “student” was captured on security cameras climbing on to the statue for the selfie. The statue shows a satyr drunkenly sleeping. It is fortunately a 19th-century of the original that was found in Rome’s Castel Sant’Angelo around 400 years ago. The original is shown above. The question is how to punish a student for such an outrage. Expulsion is an obvious choice but it is doubtful that most students can afford the repair of such an item. Moreover, the pictures show shattered remains of the leg — raising a question about the ability to restore the leg as opposed to fabricating a new leg. Do you think such acts should result in criminal charges for a student or tourist? Would such a prosecution serve a real purpose or would a long-lasting restitution penalty with garnishment be sufficient? This person, when found and charged with destruction of property. Should also be banned from ALL museums. Like a wanted poster. Although it may seem somewhat arbitrary, this punishment would be fit for any Iconoclast. Intended or not. Checking the news reports, it does not appear that they have an actual suspect in this. They have a witness who said they saw a student that they think is a foreign student. But I can’t find where they actually have a particular person to charge. The offender absolutely should be punished; if not jail time or a fine, community service for an extended period seems reasonable. I know Professor Turley linked to an earlier case where damage was done by an American tourist, but I do not see any information stating that this offending tourist was an American. I would think it would be a criminal issue, as stated earlier, presuming that there were signs warning visitors to not touch the artwork. Selfie is just another word for selfish. As I understand the law in Italy…. The kid may be prohibited from exiting the country until this matter is resolved…..since this was not an intentional act of destruction…. But pure negligence…. I’m doubtful the state department will revoke his passport…. But since we are at odds with Italy over the US military bases there and they kinda want us outta there…. They may have his passport held to prevent travel…. Since the judgement part of the brain doesn’t develop in the male human until early 20s I suggest that all males be carefully supervised until the age of 23 or so. This would allow for fewer arrests for stupidity from drinking, dare-devilry, and other such nonsense. Now, 23 is just a guestimate for the best age to let them loose (I know many men who are well past 40 who still haven’t properly developed that part of their brain) but it would be a start. I am at an artistic loss here. 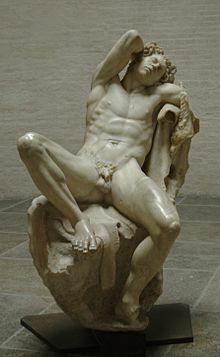 The written description says that the satyr has animal feature, however the picture does not show any animal features. Personally, I think you sue the kid for the price of the replacement. If he was on a sanctioned school trip, then you expel him. If he was on his own, the school stays out of it. However, having followed some cases in Italy, the authorities will try to connect him to some Satanic group, claim it was part of a Satanic ritual or rite of passage and jail him for life. I wonder if there were signs strictly prohibiting touching (much less climbing on) the exhibits. If so I imagine there could be criminal sanctions, Whether or not there were this was criminal, an horrendous action by an idiot who needs to pay, and pay dearly for it, not only to teach him a lesson but as an example to the other idiots who may find what he did humorous and try to follow suit. I don’t know what Italian law would proscribe for this act, that is if it is considered criminal. My state does not have have a Negligence or Reckless culpability standard for Malicious Mischief; it requires Intent. If this was in my state it would not be a criminal matter due to lack of criminal intent to damage the statue. Because of this, I find it difficult to recommend a criminal charge on what this person is alleged to have done. Civil damages, certainly. This is different from someone carving their name on a stone face which is clearly intentional damage and this which though very stupid is not necessarily willful damage. This was no “accident.” Their intentional and inappropriate action caused significant damage another’s property. Of course they should be charged with a crime. If I were a museum curator, I wouldn’t want this fool within a city block of my museum. I am sure the issue is complicated by the fact he is a foreign tourist, and civil sanctions such as you mention may not be enforceable. On the other hand, maybe the Milan city services department needs some help with garbage collection or cleaning public restrooms. I think the State Department ought to revoke his passport the minute he gets back; at least for a time, until this is sorted out. Does anyone know if he is back stateside yet, or is he locked up there? I’d say a thousand hours of community service as a museum guard should do the trick. How about…… A leg, for a “Leg”??? ?